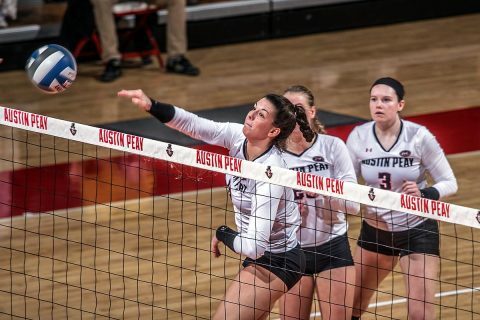 Clarksville, TN – Austin Peay State University’s volleyball team swept a five-set exhibition against Trevecca, Tuesday afternoon, August 21st, 2018 at the Dunn Center. Sophomore Chloe Stitt paced the Governors with 15 kills in four sets of action. Senior Cecily Gable chipped in 13 kills and junior Jenna Panning tacked on a 10-kill outing. Sophomore Brooke Moore posted an errorless outing, recording five kills on five attempts in three sets. Senior setter Kristen Stucker notched 43 assists in three sets of action and had three kills. Sophomore setter Caroline Waite took over in the match’s second half and finished with 23 assists and two kills. Austin Peay’s servers put forth a strong showing throughout the contest, finishing with 14 service aces. Nina Korfhage finished with four aces while freshmen Jaymenson Kinley posted three aces. Senior Kaylee Taff did a little of everything in the exhibition, posting nine kills, two service aces, a team-high four blocks and three digs. She finished with 13.5 points, second on the team behind Stitt and tied with Gable. Austin Peay posted 78 team digs in the contest with 14 of its 15 players recording a dig. Starting libero Ginny Gerig led the way with 18 digs in four sets while backup libero Jaymenson Kinley had 12 digs in three sets.